This is a model of a Propane Tank. Originally created with Blender 2.79 and textured using Substance Painter. This model contains 1 separate object. This model contains 3152 polygons. This model contains Blender Cycles materials. All preview images are rendered with Blender Cycles Renderer. Product is ready to render. Render setup is included. Propane_Tank_1B_AO.png 1024x1024. Propane_Tank_1B_BaseColor_Green.png 1024x1024. Propane_Tank_1B_BaseColor_White.png 1024x1024. Propane_Tank_1B_Metallic.png 1024x1024. 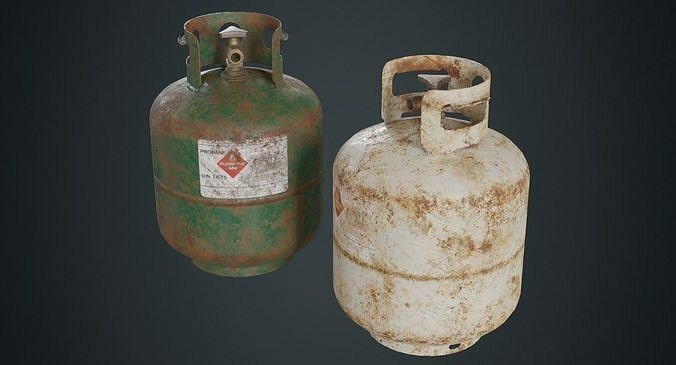 Propane_Tank_1B_Normal.png 1024x1024 X+Y-Z+. Propane_Tank_1B_Roughness.png 1024x1024. Model is built to real-world scale(the unit system is metric). No third-party renderer or plug-ins needed. Put the files and textures into the same folder and start rendering.